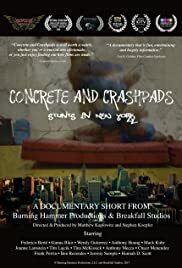 "Concrete and Crashpads - Stunts in New York" is a documentary film that offers a glimpse into the invisible world of New York's booming stunt community. The life of a stunt performer is lived in the shadows, without fanfare or recognition. This film peeks into the lives of some of the men and women who put their bodies and lives on the line, or aspire to do so, for an audience that may not know they even exist.